Following up on my post yesterday forecasting Scottsdale housing inventory in 2014, I looked at the same factors for the Chandler AZ housing inventory. You might say the big increases in home prices in 2012 led to a 50% increase in new normal SFR listings in Chandler in 2013. So you might then forecast that the big increases in home prices in 2013 will lead to a ballpark 50% increase in new normal SFR listings in Chandler in 2014. If new normal listings continue to increase by anywhere near 50%, the inventory of SFR homes listed for sale in Chandler AZ will skyrocket. That’s because the increases in new normal SFR listings won’t be offset by falling numbers of new distressed listings anymore. Distressed listings are becoming so low they can’t really fall that much anymore. Practically all new listings will be normal listings and new normal listings are skyrocketing. 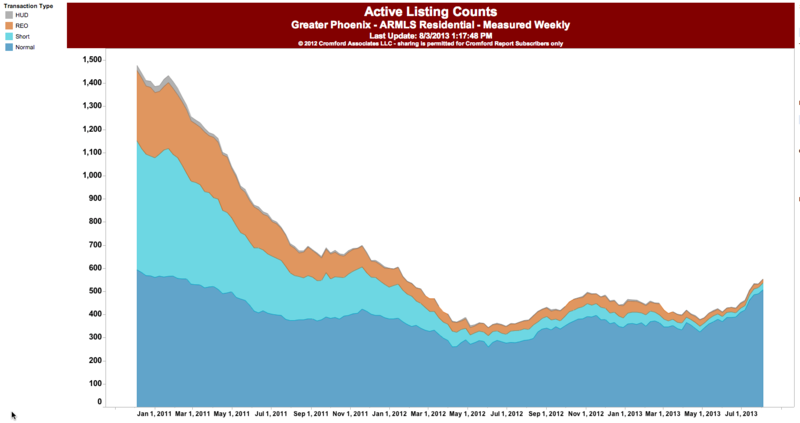 I expect we’ll see a significant rise in Chandler inventory before the end of this year and by this time next year we’ll be into 2011 levels of inventory. Excludes homes under contract. Click graph to enlarge. Updated Aug 4 (Thanks, Mike).